As someone who only recently rediscovered Mike Scott's enormous back catalogue (both as a solo artist and The Waterboys' heart and soul), I consider this latest release to represent his absolute best work, as great as anything he has so far created. Given his penchant for exploring diverse musical styles and his successful refusal to be shoe-horned into any particular genre, fans of Mike Scott's music are roughly divided between those who only love the songs of this or that period, and the much smaller group of those who simply embrace everything he does. For myself, I enjoy about 90% of his output, and the same can be said for this album. My favourites so far include "The Hosting of the Shee", "Mad as the Mist and Snow", "White Birds", "Politics", and the incredibly poignant "The Faery's Last Song". The treatment of "The Lake Island of Innisfree" is pure genius, as this over-exposed Yeats classic presented a host of spiked challenges, all brilliantly overcome by the robust bluesy approach. Another stand-out is "Before the World Was Made", a gorgeous duet with Katie Kim, one of the most interesting female voices I've heard recently. In fact, there isn't a weak track on the whole album and I suspect people's favourites will vary greatly. What is beyond discussion is the superb quality of this music, a welcome change from today's frankly depressing standards. A special mention for the other superb musicians involved, especially the mercurial Steve Wickham whose fiddle work reaches new heights in some truly inspired solos. I was pleased to see a fair amount of media interest for this potentially "difficult" release and I have yet to read a less-than-positive review. 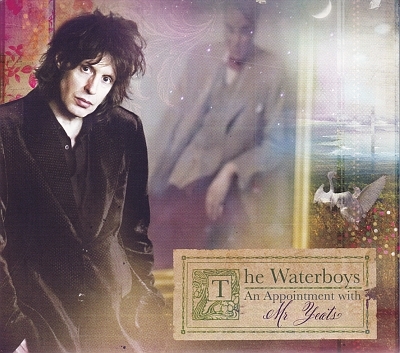 For those considering a purchase, the Waterboys Soundcloud has three tracks available to preview. Highly recommended. Out of all the live concerts in my collection, this is one of my top three favourites (the others being "Concert For George" and Procol Harum's "Live In Denmark"). In fact, in addition to the DVD, featuring superb footage of a very special performance in front of a delighted home crowd (at London's Apollo), there is also a slightly abbreviated and curiously re-arranged CD, which is best regarded as a bonus item. Don't be put off by the minimalistic packaging ... the contents are pure gold! I would be happy to own this concert just for the stately version of "A Song for Europe" and the brilliant extended "Tara" but there are 18 more excellent reasons to buy this. 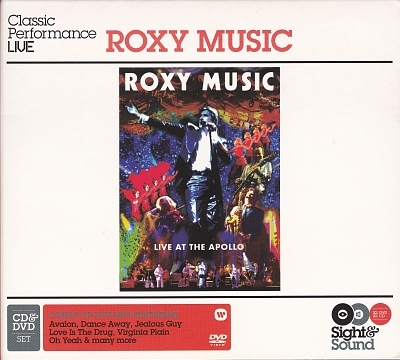 My first ever live concert was at London's Rainbow Theatre featuring a double bill of Roxy Music and David Bowie (as Ziggy Stardust). It was unforgettable and over the years I have followed both acts with varying degrees of enjoyment. This concert features many of the early numbers that made Roxy so original and innovative, and it was a treat to see them performed again with such energy and obvious relish: "Re-Make/Re-Model", "Ladytron", "Do The Strand" and "Virginia Plain", joyfully completed by the audience. It was a happy day indeed when the original Roxy members (Bryan Ferry, Phil Manzanera, Andy Mackay and Paul Thompson) decided to get together again and see if they could recapture the magic. Only Eno is missing, but in his place we have the effervescent Lucy Wilkins who handles the vintage synth equipment with competent gusto, as well as delivering some thrilling electric violin gems. The other musos beefing up the sound include the exquisite pianist and MD Colin Good, quietly capable guitarist Chris Spedding, multi-instrumentalist extraordinaire Julia Thornton, soulful Zev Kats on bass, superb vocalist Sarah Brown, and the diminutive Yannick Etienne, who joins the cast to deliver her unique Avalon vocals and thereafter contributes additional vocal texture. All these musicians get their chance to shine in the many solo features scattered throughout the performance. I have a growing collection of concert DVDs. To my mind, the good ones offer superb value as they can be enjoyed again and again, certainly more often than even a favourite movie, and they place the spectator right on stage with the performers. Also the release date is immaterial, as great music does not age. Several elements can make or break a music DVD, including the sound quality, how well if was filmed, the synergy among the musicians and their rapport with the audience. 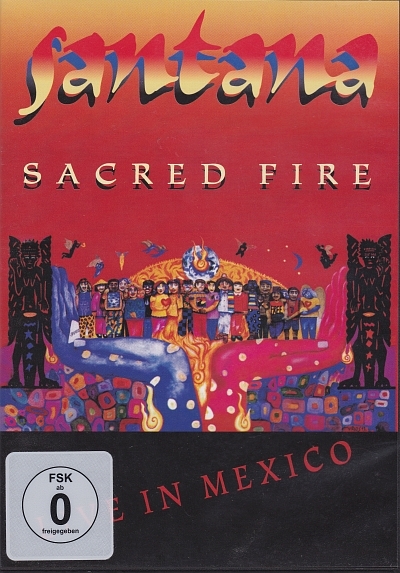 “Sacred Fire” scores highly on all counts (although it's not in surround sound). This performance was recorded in May 1993 in Mexico City on “home ground” in front of an ecstatic audience and it also features some stunning footage taken in and around the venue, which I thought added a lot of interest. The line-up on stage with the brothers is excellent. The musicianship is top-notch, and it is difficult to single out any particular contribution: spell-binding keyboards from Chester Thompson, superb bass by Myron Dove, stirring vocals courtesy of Alex Ligertwood and often the whole band, power-house percussions (too many to mention), all anchored by some of the most inspired guitar-work from Carlos. Jorge is also featured in some spectacular solos and it is uncanny how much he reminded me of that other famous guitarist George (Harrison). The whole DVD has a very warm and engaging atmosphere, the musicians are having a wonderful time and it's fiesta time among the audience. You don't have to be a Santana fan to enjoy this concert. I can warmly recommend this DVD to anyone who appreciates exuberant live music with a Latin flavour and a deep human dimension.